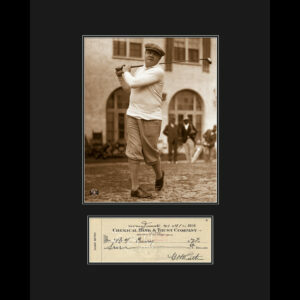 Framed 16×20 of a fuji crystal archival photo of Babe Ruth entitled “Babe At the First Tee” Features a reproduction of a personal check signed by Babe Ruth. COA included. 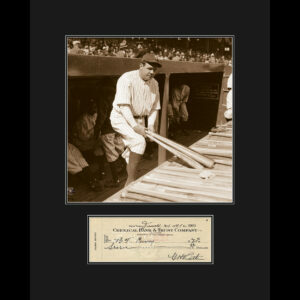 Framed 16×20 of Babe Ruth coming out of the dugout with bats. 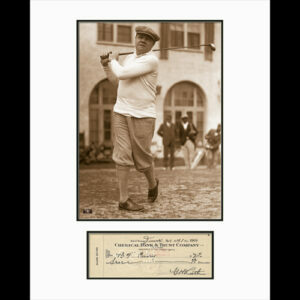 Includes a reproduction on a personal check signed by Babe Ruth. COA included. 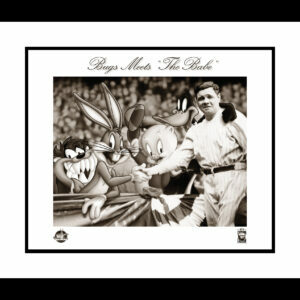 This framed 19 x 22 framed photo-animation features Bugs Bunny shaking Babe Ruth’s hand. 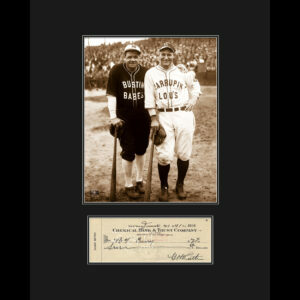 The original photo was taken on April 4, 1923, featuring Warren G. Harding shaking hands with Babe Ruth. Licensed by WB and Cooperstown. Includes a COA. 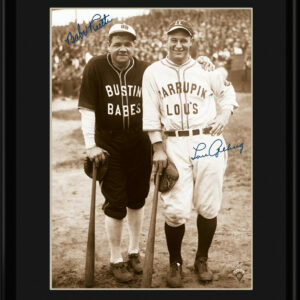 Framed 16×20 of a fuji crystal archival photo of Babe Ruth and Lou Gehrig. 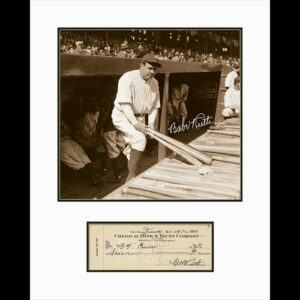 Entitled “Bustin Babes and Larupin Lous” Features a reproduction of a personal check signed by Babe Ruth. COA included. 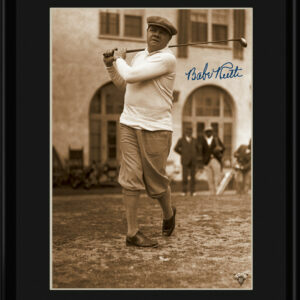 This collectible vintage photo-lithograph entitled Babe Ruth “At The First Tee” taken at the Jungle Country Club in St. Petersburg, Florida during the 1930’s. Facsimile Signature. Comes matted and framed. This collectible archival photo-lithograph entitled “King of Baseball” taken on October 13, 1921 at the Yankee Clubhouse. 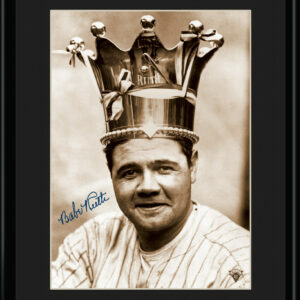 The crown has the inscription of “King Ruth’ an stands more than one foot in height and is studded with a row of 49 engraved minature baseballs. Facsimile Signature. Comes matted and framed. 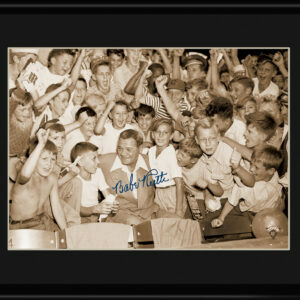 This collectible vintage photo-lithograph entitled “Babe with the Kids’ features Babe Ruth surrounded by numerous kids. Facsimile Signature. Comes matted and framed. 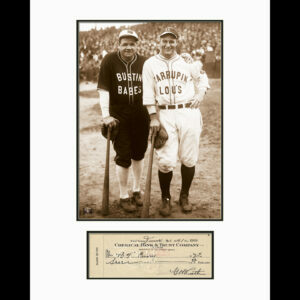 Archival photograph featuring Babe Ruth and Lou Gehrig taken on October 13, 1927 during their Japan baseball tour, featuring facsimile signatures of both Babe Ruth and Lou Gehrig. Comes matted and framed. 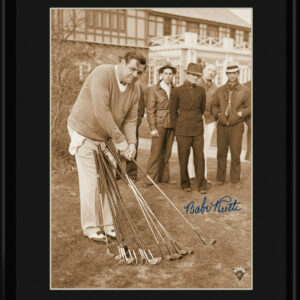 This collectible vintage photo-lithograph entitled Babe Ruth “Choosing The Right Club” taken at the Fresh Meadow Country Club in Bayside, New York on November 12, 1937. Facsimile Signature. Comes matted and framed.